This is an excerpt from Doing Exercise Psychology, edited by Mark B. Andersen, PhD, and Stephanie J. Hanrahan, PhD. Presence is the starting place for helpful and healing alliances with our clients. Freud (1912/1958) described this stance a century ago, well before the advent of mindfulness approaches in psychotherapy: "It rejects the use of any special expedient (even that of taking notes). It consists simply in not directing one’s notice to anything in particular and in maintaining the same ’evenly suspended attention’ in the face of all that one hears"
When we are mindful, we are in this receptive, evenly suspended, and present state, as opposed to a protective state. Subjectively, we are open, accepting, nonjudgmental, and curious as we alternately observe our endless streams of thoughts, feelings, sensations, and perceptions and our clients’ verbal and nonverbal communications. Neurologically, this receptivity correlates with an approach state of cortical activity (see figure 1.1, e.g., increase in activity in the left and medial prefrontal cortex), moving toward, rather than away from, difficult situations (Siegel, 2010). If we encounter internal or external stimuli we find threatening (e.g., a well-being concern with which we aren’t comfortable, a story that triggers memories of our own imperfect pasts), our prefrontal, limbic, and brain-stem processes may coordinate a protective fight-flight-freeze response. Subjectively, we may experience this response as noticeable discomfort in our minds and bodies. In the case of fight or flight, our sympathetic nervous systems (e.g., increased heart rate and muscle tension, shallower breathing) are activated. In a freeze stress response, the dorsal branch of our parasympathetic nervous systems is activated, frequently resulting in a sense of deflation, dissociation, and reduced functioning. The avoidance response may also be subtle (e.g., impatience, boredom, fatigue, inattention) and even outside of our awareness. 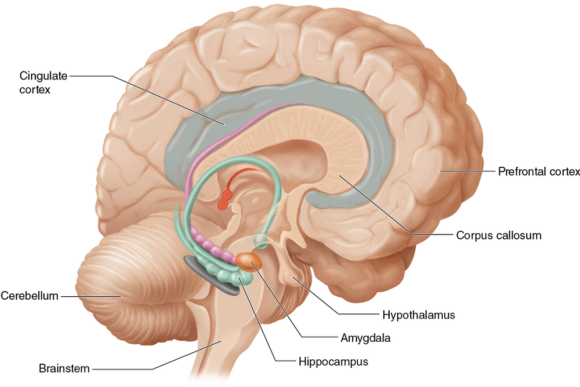 The limbic and cortical structures of the brain. Clients may experience our shifts from receptivity to protection (or absence) in a variety of deleterious ways. The pathways for such transmissions may be objective as well as subjective. Iacoboni (2008) has suggested that recently discovered mirror neurons may contribute to our abilities to connect with others. Initial research (Iacoboni et al., 1999) found they function to detect and imitate others’ behaviors, but Iacoboni has since suggested that mirror neurons may also translate detected behaviors in others as outward signs of inner states, contributing to the neurobiological reproduction of those states in the observer. Often primed by past hurts and disappointments to be socially and neurobiologically vigilant for signs of impending hurt and disappointment, clients may interpret our vigilance or absence to mean we, too, cannot handle their difficulties. And if we, the professional healers, cannot handle their difficulties, then where does that leave our clients? Thus, it would be helpful that we (continuously) learn to mindfully uncover, expand our tolerances for, and work through our own histories of hurt, triggers, and perceptual biases and filters to increase our presence. As we expand our windows of tolerance, we regain the receptive ability to consciously and fluidly shift through arising difficult thoughts, feelings, and sensations without our mindful awareness collapsing in neurobiological or cognitive-affective preoccupation, avoidance, and other protective strategies (Siegel, 2010). With such presence, we are well positioned for the next element. Read more about Doing Exercise Psychology.